Bragi announces "world's first" smart wireless headphones | What Hi-Fi? Smartphones, smart TVs, smartwatches and more – "smart" technology looks set to become more and more prominent in 2014. And now we're about to see the "world's first" smart headphones courtesy of Munich-based Bragi. The Dash brings together audio, biometrics, Bluetooth connectivity and more into a single product and now a crowdfunding campaign has been launched by Bragi on Kickstarter as it seeks to make the headphones a reality. Danish entrepreneur and former Harman head of design Nikolaj Hviid is behind concept for The Dash, with former AKG head of mechanical design Josef Scheider among those who are helping to bring this latest project to life. Hviid said: "I imagined a discrete assistant that would entertain and take care of me. Help to understand my body, and let me know when I had reached my limit. Help me to get better at what I do." The Dash can play music from an embedded 4GB/1000-song music player or from your smartphone via a Bluetooth connection. The headphones uses aptX technology to stream the full music bandwidth over a wireless connection. 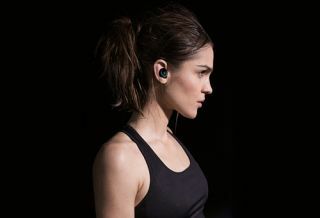 Meanwhile, the buds will track movements including pace, steps and distance; measure heart rate and oxygen saturation; and act as a Bluetooth headset that delivers clear voice quality through an ear-bone microphone. Bragi says The Dash will offer "impressive" noise isolation, but will let you allow ambient sound into the headphone with a transparent audio feature that can be enabled or disabled with a simple swipe of the touch surface. Three sizes of silicone sleeves – S, M and L – are provided with The Dash package to provide a three-point secure fit for a wide range of ears. One earphone weighs less than 13.8g and there are no cables to pull on your ears. In terms of technical specifications, the headphones have a response bandwidth of 20-20,000Hz, a 16-bit stereo audio format and an output of 10mW RMS with level limit, as well as less than 2 per cent total harmonic distortion (1KHz, 1mW). It is expected the battery will give up to three hours of play and track time or four hours of play time, with charging time of less than one hour. The Dash can be recharged using a USB cable or DC adapter. The Dash offers full compatibility with a variety of Bluetooth-enabled devices – iPhones (4S onwards); iPads (3rd Generation onwards); and Android devices with Bluetooth LE hardware running under 4.3 Jelly Bean or later. There is, however, only limited support for Windows Phone and Blackberry. Meanwhile, free iOS and Android apps will be available at the launch of The Dash and developers will be able to order a software development kit to get access to processed and unprocessed data feeds. Bragi has already surpassed its funding aim of $260,000 on Kickstarter, with The Dash expected to go on sale at a suggested retail of price of $299 plus shipping costs if you're in the UK. It appears that you will be able to get your hands on The Dash this autumn.